Last Friday the government of Manitoba introduced legislation to automatically suspend licenses of drivers caught texting at the wheel, for three days. The legislation also stated a second offence within 10 years would also result in a seven day suspension. But now it appears a slight break has been granted for drivers once they’re caught for the first time. According to CTV News Winnipeg, legislation tabled yesterday now will grant those caught texting behind the wheel a temporary 24 hour permit to drive home. Those caught in rural areas will have 48 hours to drive home, before suspended licenses kick into effect. Why the change? To prevent cars being abandoned on streets. The new distracted driving legislation will allow for hands-free equipment to be used, while suspended licenses will only occur if a police officer spots a driver with a device in hand. 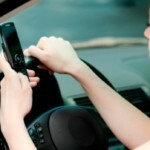 Suspensions are in addition to existing distracted driving fines and demerit points. Part of the new legislation also includes careless driving, which will now become a reportable offence which will be hit on a driver’s record with Manitoba Public Insurance (MPI), instead of previously being a fine. Manitoba is doing what many think should be the law in every province (Ontario may be next). I can’t tell you how many times I’ve seen people drifting into another lane, only to find out they’re staring down at their phone.